BOO! I hope this finds you all well. This is my annual reminder that Halloween can be a tough holiday for pets, especially DOGS. While some dogs don’t mind, most can get really freaked out on this holiday. You’ve got throngs of costumed kids, teens, and adults running and screaming all over the area. Adding a dog to this mix can be a recipe for disaster, especially for the dog. You may think it’s a good idea to dress up your dog and go trick-or-treating but your dog will be happier and safer at home. This is especially true for puppies and for older, and skittish dogs. Your dog may have been comfortable with Halloween when he was younger but as dogs age their tolerance and comfort for noise and stress change, just like us. Please make sure you walk your dog as early as possible. Our neighborhood gets record crowds on this day, some years we see thousands of people come through. The smaller kids start out at around 5-5:30 p.m. That is still a relatively safe time to walk your dog, though keep in mind that very few parents teach kids not to run or scream around dogs any more. Dogs will instinctively chase and/or jump at people who run at/or towards them. A dog can easily knock a child down in such a scenario. Once the big crowds are out, it’s just best to have your dog at home. If you’re not going to be home with them, keep your front porch and front room lights OFF so people don’t ring your bell incessantly and drive your dog crazy. It’s best to leave your dog towards the rear of the house with easygoing music such as classical or new age, or white noise. If your dog is especially skittish and responds to the ThunderShirt, this is a good day to use it. Do not walk your dog during peak trick-or-treating hours of 6-9 p.m. Trick-or-treaters in our area are often out until 10-11 p.m., even on a school night – so wait until at least 10 p.m. to go out again for your dog’s bedtime walk. Kitties can equally get scared and harmed on this holiday. Keep your cats away from the front door while you hand out candy to make sure they don’t get spooked and run out when the door is open. And if you have indoor/outdoor cats, please bring them inside for their safety. You don’t want to heighten the risk of them running into a passing car if spooked or being harmed by someone as a Halloween prank. Keep candy away from pets, both dogs and cats. Chocolate, macadamia nuts, raisins, and Xylitol are dangerous to pets. Save tricks for the kids. Masks, face paints, screaming, and loud noises can scare animals. Keep pets inside. Block access to your front door during trick or treating. Keep pets in a calm space and make sure they’re wearing their ID tags in case they bolt. Avoid animal costume chaos. Make sure costumes fit well and don’t stress out your pet. Take your dog out for a walk before/after peak trick-or-treating times and make sure he is leashed. 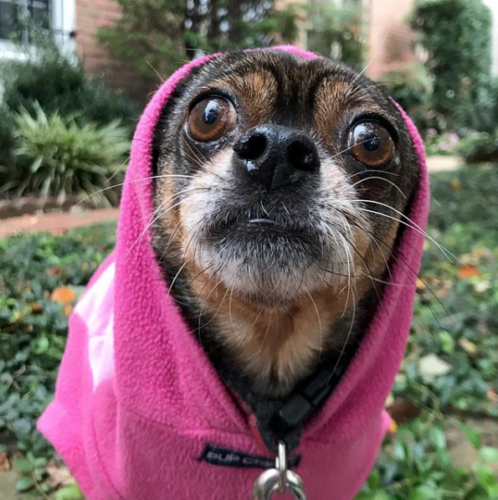 DC has a leash law that requires all dog owners to leash their dogs (for their/everyone’s safety) at all times but you especially want to make sure you heed this law on Halloween. I would recommend avoiding flexi leashes on this day, keep your dogs close to you with a 4 ft leash. One last thing… on the day after Halloween, sidewalks are an obstacle course of candy and chocolate. In the dog walking world, we consider it the worst dog walking day of the year. Please keep that in mind when you take your dog out for his morning and evening walks on the day after – and watch for things your dog may try to pick up. Every dog’s tummy is different and while one piece of candy or chocolate may not harm them, it’s best if they don’t eat any. The sidewalks and streets are also commonly littered with remnants of costumes, toxic glow sticks, and other decorations which could be hazardous if ingested by your dog. Stay safe. And HAPPY HALLOWEEN!